Fraternity rush is a hornet’s nest of potential safety hazards. When all chapters on campus are competing for potential new members over such a short, chaotic period of time, it’s easy for brothers to get a little ahead of themselves. You always want to put your best foot forward during rush, but you also want to make a big splash--sometimes literally, in the chapter house hot tub. You want to impress these young men with how cool you are, how bouncing your house is and how big and fun your events are. You are a social fraternity, after all, and with all the hard work you want to show you’re capable of providing a good time for your potential future brothers. Of all the parties on Greek Row, it should be yours people remember as the most epic, greatest of all time. During rush, however, the problem arises when hubris or lack of foresight gets the best of you and you venture into territory that can lead to unsafe situations for brothers and potential new members. That’s not what anyone wants to see. If your chapter has been around for a while, you might’ve even already experienced this for yourself or witnessed another chapter who has. 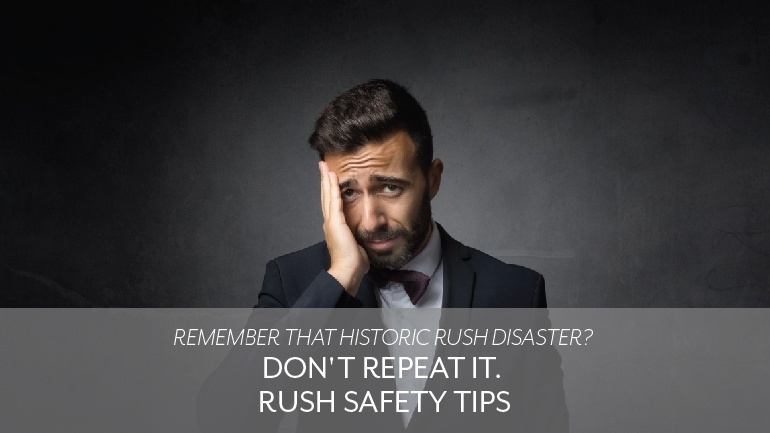 Although we here at Pennington & Company hope this isn’t the case, it’s important to Remember Not to Repeat That Historic Rush Disaster by adhering to these Rush Safety Tips. The North-American Intrafraternity Conference calls for all rush events to be dry. But in case you needed a reminder, it’s essential that brothers avoid serving drinks or holding events at establishments that serve drinks. There’s a good reason for this. For one, a great many undergraduates who are rushing fraternity chapters each fall are freshmen, meaning they’re almost all underage. Secondly, it sets a terrible example for potential new members to see that your chapter feels it can only appeal to them through alcohol. This shouldn’t be the image any chapter wants to put forward, quite frankly, and when chapters are known as “the drinking fraternities,” you can see the results in the news in chapter house windows being boarded up and chapters getting kicked off campuses. Your main focus at any rush event should be to try to connect on a values level with potential new members to feel out if they’re a good fit for the chapter, and for them to get that same chance to assess for themselves. Beyond dry rush events reducing the risk of underage drinking, bodily injury or tarnished images, they also speak to a broader concept that many chapters around the country have begun to adopt: dry fraternities. Dry fraternities may sound like a bummer in concept, but in practice going dry can be a very positive step toward a healthier and more fulfilling fraternity experience. It means less risk, less potential for substance abuse and addiction issues, and it means more focus on fostering a rewarding experience for all brothers, whether it’s rush week or not. And whether you realize it or not, a lot of potential brothers are looking for exactly that. Listen. Some of us have served as the recruitment chairman, and we know all about that little megalomaniacal twinkle you get in your eye when you’re thinking up these elaborate rush event ideas. Bounce houses. Chocolate fountains. Ice sculptures. Ferris Wheels. Jumping over burning furniture on dirt bikes. PSA: Generally speaking, it’s definitely an unspeakably terrible idea to jump over burning furniture on dirt bikes. Like, ever. But even the less obviously risky ideas can still host potential hazards. Start by avoiding any rented equipment or situations that would require potential new members to sign any kind of safety waiver, even if it’s as innocuous as a giant bounce house. If you hold larger events like concerts, speaking engagements or parties at your fraternity house, make sure regulations are adhered to such as building fire safety codes for maximum occupancy, no open flames or other potential weapons or dangerous items, and so forth. Coordinate with your risk management officer and fraternity and university officials to make sure any questionable situations are ironed out in the final logistics. Remember, a safe rush will not necessarily translate to a good rush, that’s down to how effective you are at engaging PNMs. However, an unsafe rush should always be considered a failure. Sometimes even if your chapter has the rush budget to compete with the other big chapters on campus, it isn’t worth dumping so much of your funds into big, flashy events when the simple approach is just as effective, and generally safer, too. Any time a crowd of people can be made less hectic and out of control, the risk will go down. On top of that, many times concerts or parties with loud music and tons of people screaming and jumping around will have the opposite of the intended effect: potential new members can barely hear themselves talk over the thumping speakers, let alone hear anything you have to say about the chapter, its values and its goals. The alternative is something straightforward and with minimal risk or distraction. Consider for instance ideas such as an outdoor barbeque, a beach or pool day, or even a formal dinner. The more you’re able to connect with potential new members in a calm, direct situation, the more everyone involved in the rush process will benefit. Fraternity rush is a time to celebrate when chapters turn a new leaf and bring in renewed vitality for their brotherhoods. Keeping it safe and straightforward ensures you can really focus on quality recruitment through and through. As the fall semester kicks into gear, what are some of the historic fraternity rush disasters you’re looking to avoid? Tell us about your rush plans in the comments below.